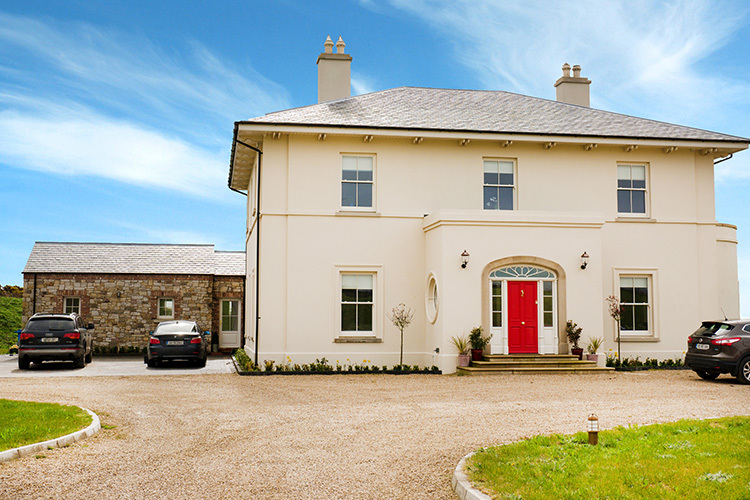 Situated just outside of Wexford near the town of Blackwater sits this stunning Victorian style newbuild that was built in 2017. The house is approximately 4050 sq. 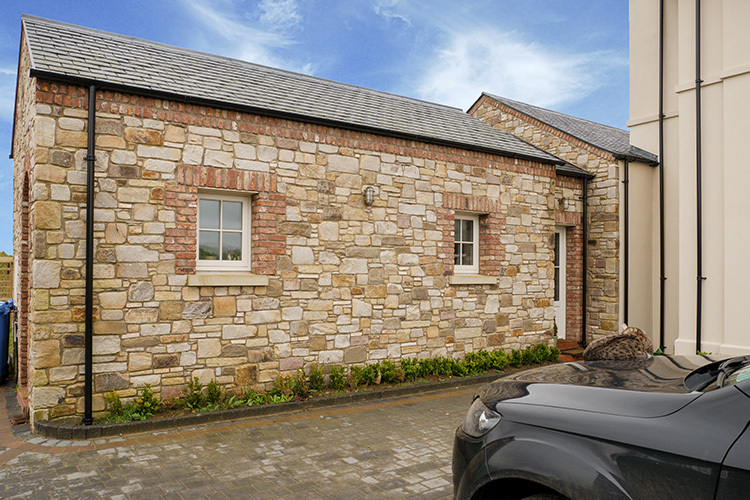 feet and features a traditional period style facade and a more contemporary extension on the back. 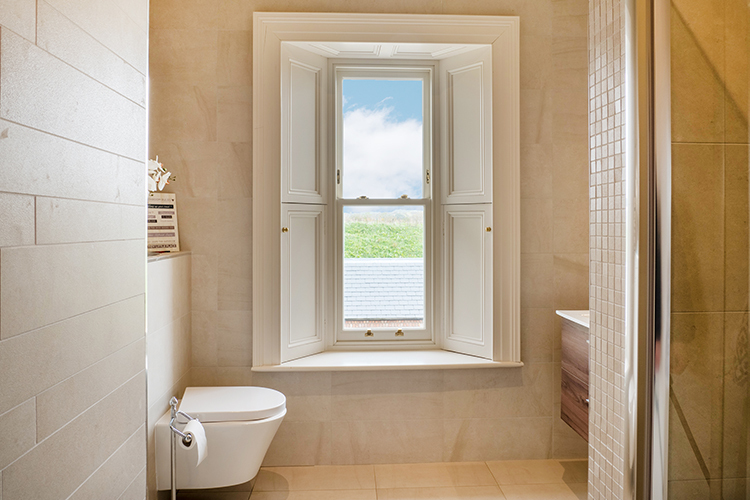 The house is designed around the sliding sash window, embellishing a true historic tone and feel for the client. The client had got in touch with the Signature design team and worked closely with them to set the requirements that needed to be met. Achieving an A-Rated home was at the core of the requirements for this New Build. 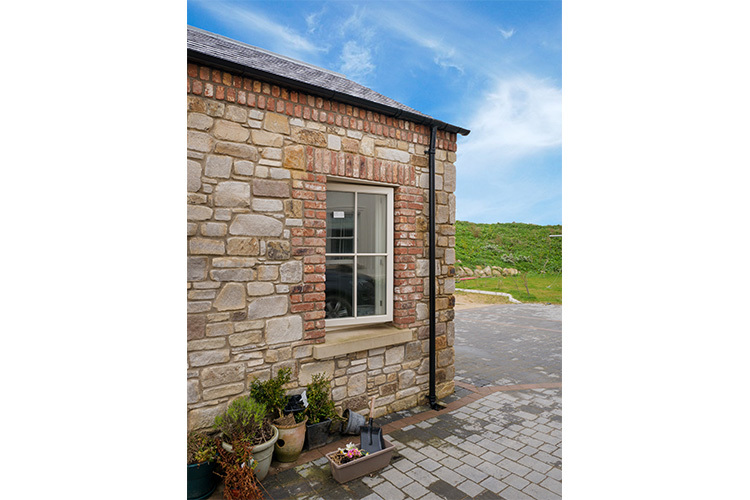 Due to the nature of their design, sliding sash windows would have a slightly higher u-value when compared to other alternatives such as casement windows. 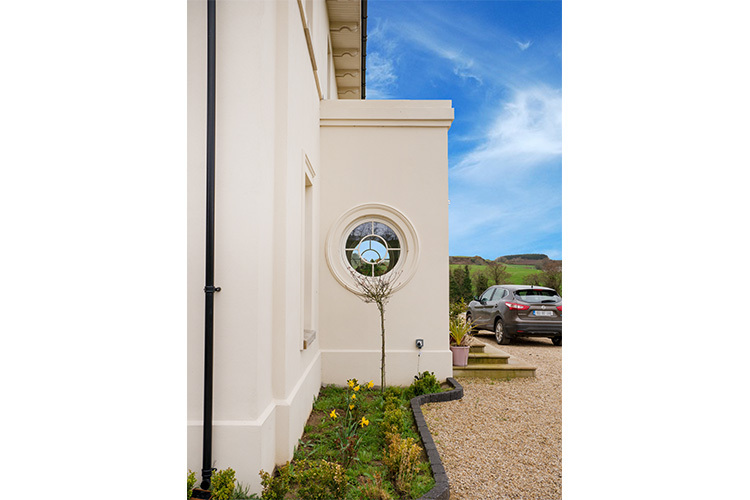 However, the clients still wanted to maintain the traditional sliding sash window look in their home as it was a central part of the overall design. The Signature Design Team put their thinking caps on and got to work on solving the dilemma of achieving a low U-Value with Sliding Sash Windows so the homeowner could achieve an A-Rated standard. In order to achieve this desired energy rating while maintaining a slim traditional sash window look, Signature proposed adding triple glazing to all the Wood French Doors, Fixed Glazing, Circular Windows & Casement Windows that were also being installed by the client. 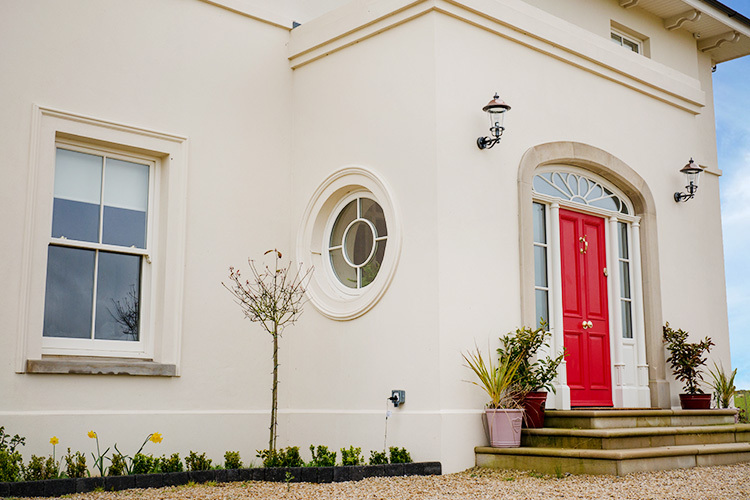 This aided in an overall lower U-Value average and meant that the client could achieve their A-Rated status while also maintaining their Traditional Wood Sliding Sash Windows that would define their home. Using triple glazing in a sliding sash window would have made the unit much heavier when operating. 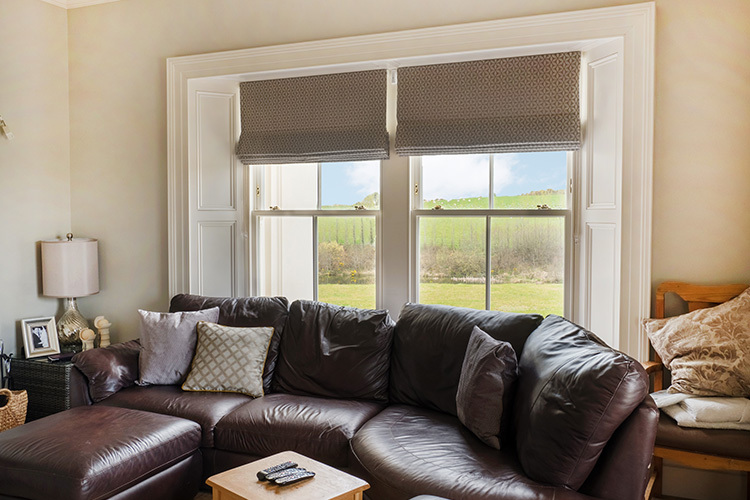 Triple Glazing would also create chunkier sliding sash window profile that would not complement the authentic traditional look of the home or meet the client’s personal tastes of a slim design. 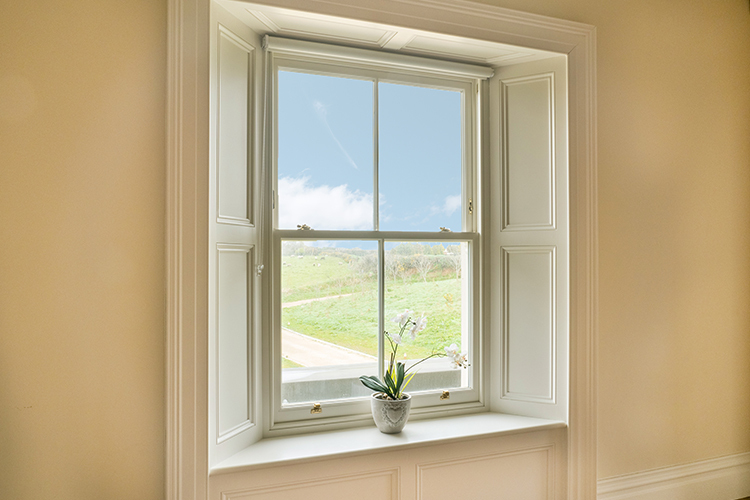 The Signature Wood Sliding Sash Window has an average U-Value of 1.5 with double glazing and is triple sealed with a weatherstrip between the sash and frame. 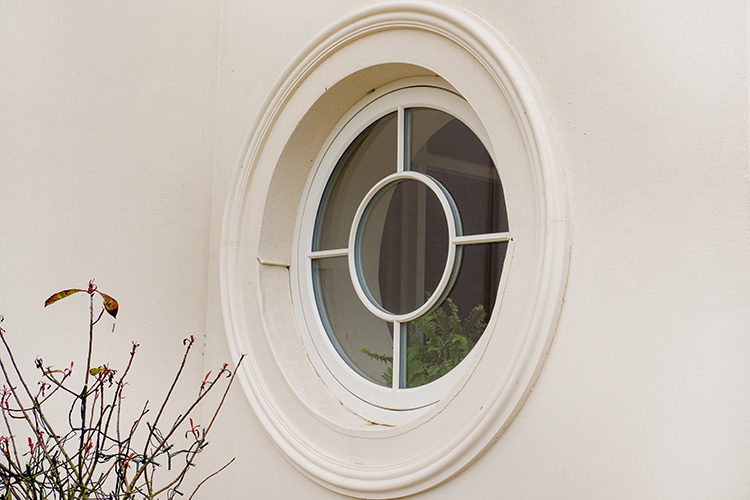 Having a quality air-tightness rating is important for a sliding sash window as it prevents both unwanted water penetration and draughts which can happen with poor quality designs. The client had also wanted to maximise their cinematic surrounding views without any obstructions or vertical breaks through their windows. 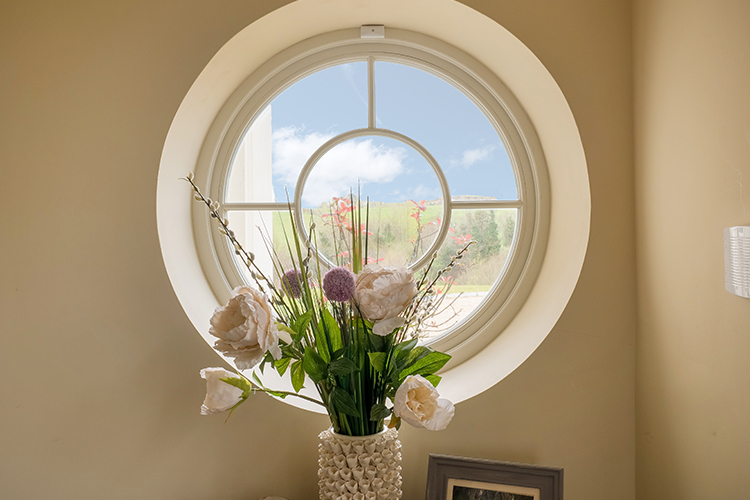 The Signature Design Team proposed that using large fixed glazing windows with a curved top feature would maximise the glass area and flood the interior with natural light. 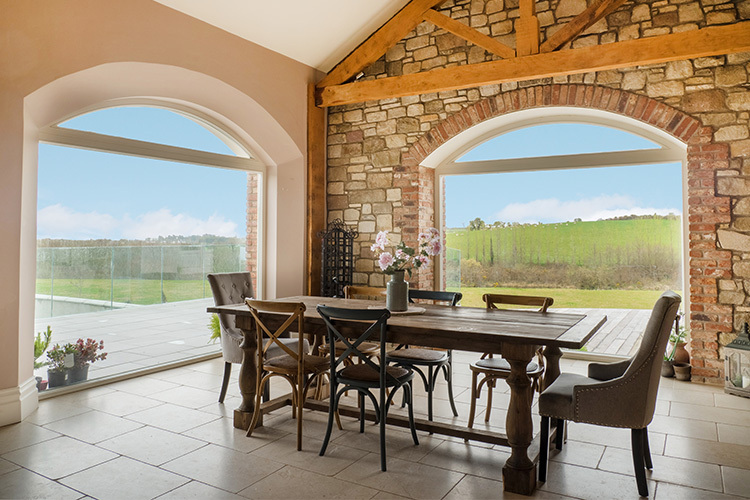 Maximising natural light in a home is something that many Signature clients often seek. The large glazing, along with tilt & turn windows, also changed the extension to a more contemporary feel which the client had sought after. 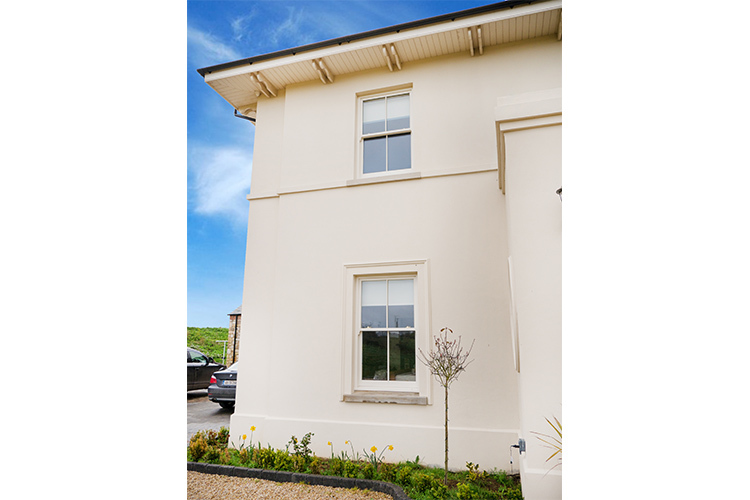 The client specified that their Wood Sliding Sash Windows would have a weight & chord balance system to maintain the authentic traditional look. 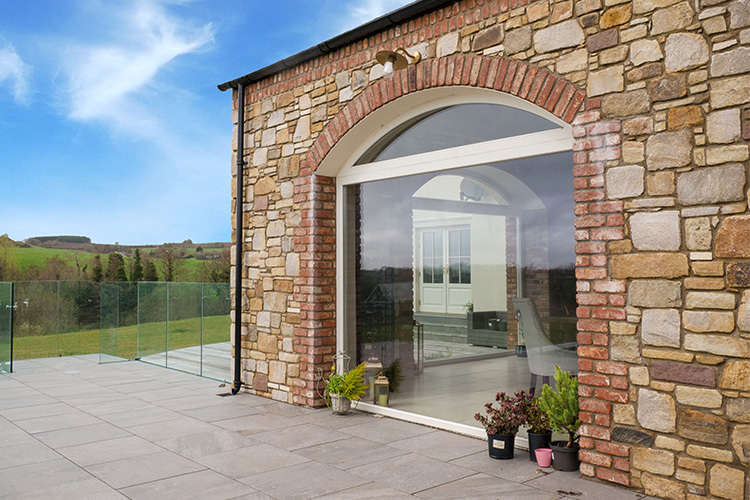 The Lambs Tongue Profile and 22mm glazing bars were also selected out of Signature’s Four Traditional Profiling Options. On the exterior, H-3 Sash Horns were applied with flat finish joints which would avoid unsightly deep V cuts. The Swinging French Doors had raised panels on the bottom 1/3rd and glass covering 2/3rds of the door. 22mm glazing bars were also applied to maintain the Victorian theme of the home. All of the windows & doors are built with Triple Laminated Finger Jointed Pine Wood which prevents the products from warping and provides a more durable wood solution. All of the hardware was finished in brass. 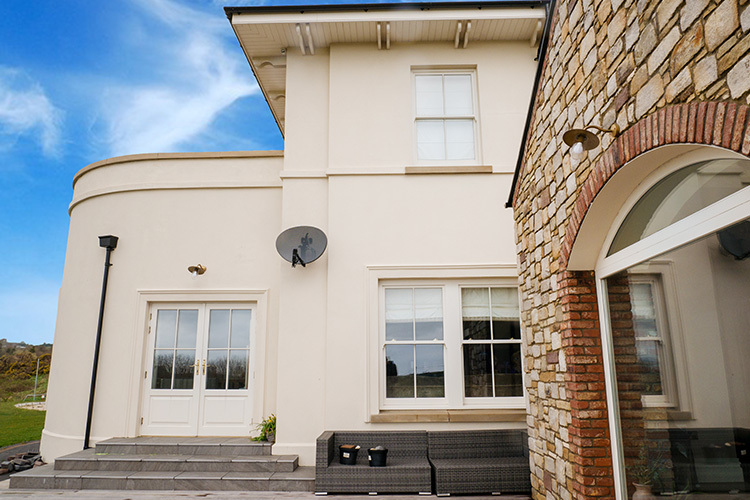 A Cream paint finish (RAL 9001) was applied to both the interior and exterior of the windows & doors, using premium quality Teknos paint to prolong the lifespan of the products. A beautiful Arched Swinging Entrance Door with tongue and groove panelling in pale green (RAL 6021) was also selected by the client. 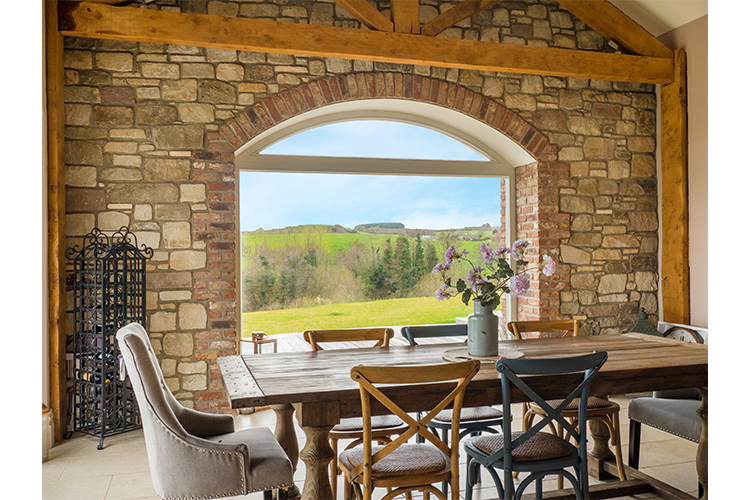 Explore our stunning range of handcrafted wood windows & doors that were featured in this case study or get in touch with us by filling in the form on the side of your screen to discuss your next project. Start you download by clicking on the button below.